This summer I ran some informal lightfastness tests. 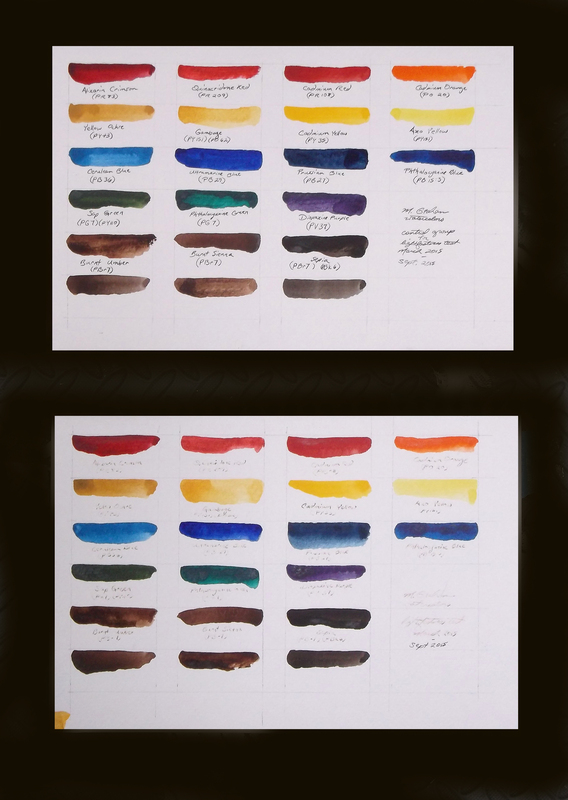 I tested a variety of watercolors (right column), markers (middle column), and pastels (left column) on acid-free sheets. I made two versions of each test sheet. The control group (top row) went into a drawer, and the other set (bottom row) went in a window for the six sunniest months of the year (in California, no less). 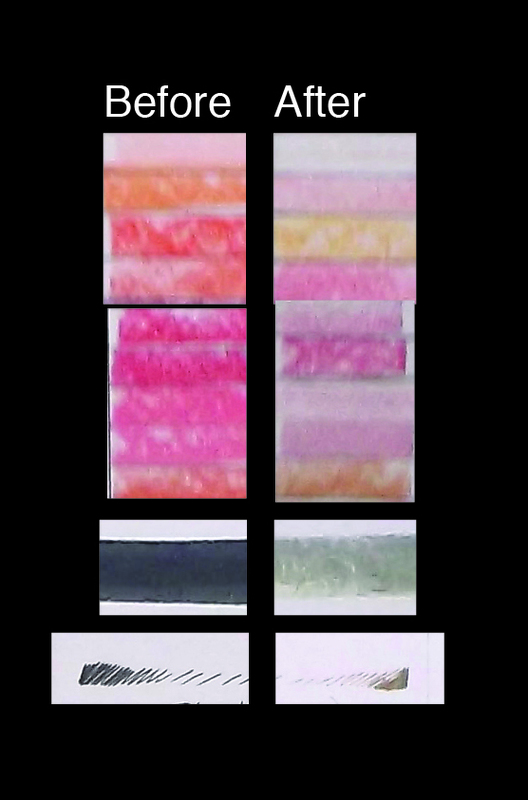 Some colors within the Prismacolor Nupastel line faded dramatically during this six-month period. This was expected, since this lightfastness test was inspired by my observations of these pastels fading within the store at which I work. Pastels have a reputation for being fugitive, and this line of pastels was no exception. The colors which faded the most were: B. Orange, Deep Orange, Madder Pink, Salmon Pink, Pale Vermilion, Scarlet, Persian Rose, Orchid, Eden Green, Carnival Pink, Orchid Pink, Rose Pink, Crimson, Old Lilac, Maroon, Pistachio Green, and Neptune Green. I noticed slight fading in the following colors: Light Naples Hue, Chrome Yellow, Burgundy, Light Sap Green, Carmine Madder, Flamingo, and Carmine Red. 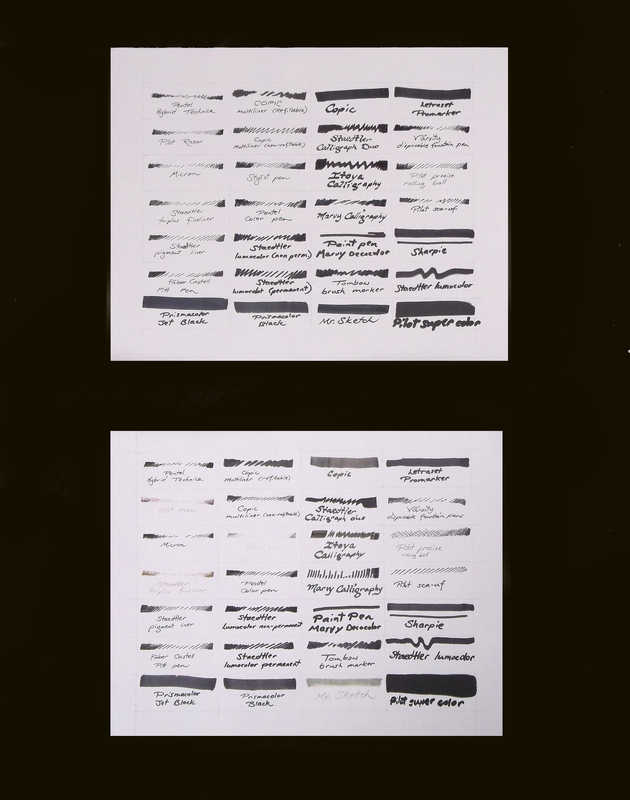 The markers were a mixed bunch of brands and styles. The worst fading occurred in the following pens and markers: Pilot Razor, Staedtler Triplus Fineliner, Stylist Pen, Itoya Calligraphy Marker, and Mr. Sketch marker. Slight fading showed in the Pilot Varsity (disposable fountain pen), Pilot Precise Rolling Ball, Tombow Brush marker, Sharpie, and Copic marker. I was surprised by the Copic’s fading, and intend to repeat this test to confirm these findings. 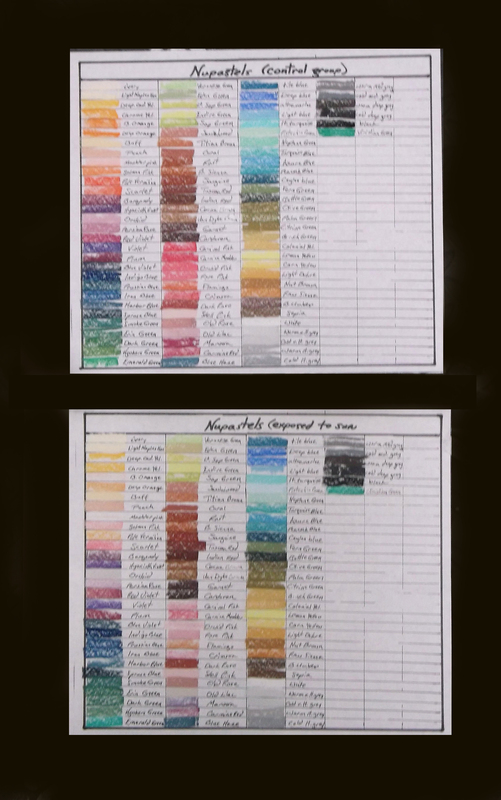 The M. Graham watercolors show no significant changes after six months of exposure to sunlight. These pigments constitute my standard palette, which was selected with lightfastness in mind. Yes, six months of sunlight is an absurd amount. This test is irrelevant to anyone whose work is going to be scanned and digitally marketed, and it is also not a primary concern for those working in sketchbooks. For those making art that might be framed and hung on a wall, however, it is prudent to know which products are the most reliable.